125th Commemorative Event in 2017! Allow me to first state to the family of the founder and also to all of the previous owners/employees of the Wilk Amite Record that the Amite County and Wilkinson County communities shall forever be grateful for your unwavering dedication to report the news. Many lives have been touched over the past 125 years. 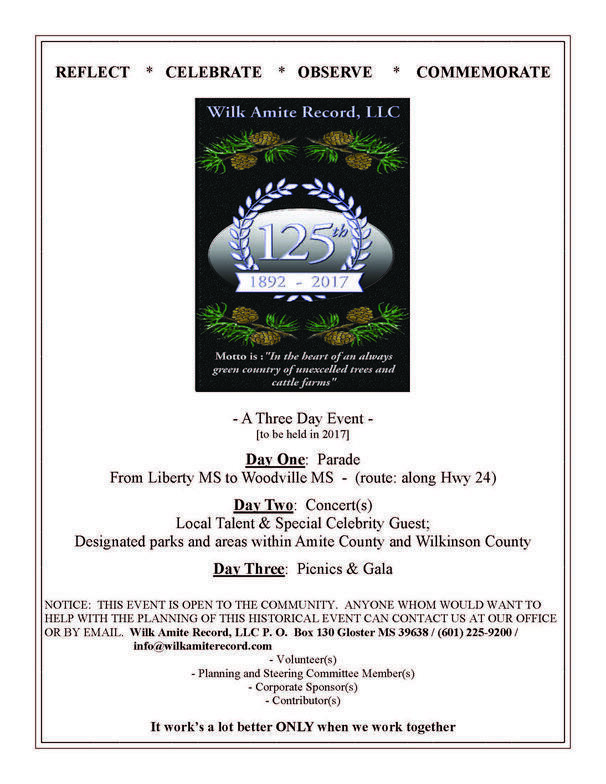 It was almost two years ago when I was asked if I would want to acquire the ownership of the Wilk Amite Record. At that time I had no earthly idea that such an historical milestone was "right around the corner". I am indeed humbled to have this opportunity. My primary objective then yet holds firm even today. I am doing what I can with what I have to keep the history and the vision alive. So, this is the community's moment. All of the community. What I have envisioned for your moment is ambitious to say the least. Nevertheless, I can recall hearing the profound statement that "teamwork makes the dream work". As we come together and begin forming the respective planning committees, I am certain that more detailed structure will be added to the plan i.e. the date(s) of the events, designated areas and etc. Everyone is welcomed to participate. Finally, there will be more announcements and instructions as we move towards the big event in 2017!